Size of Male: 24 lbs., 17 in. Size of Female: 22 lbs., 16 in. You can hear them scream, growl, chortle and such, but Basenji never bark. These miracle dogs are unable to physically do so. Still, the breed is far from handicapped, sporting a delightful amount of intelligence, intuition, playfulness and acute hunting skills. The females compound the breed’s uniqueness by having 2 estrus cycles (instead of just one) annually. 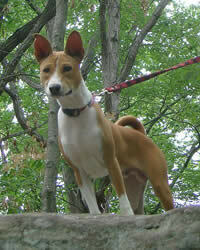 Basenji literally means “bush thing” in Egyptian tongue. Believed to be a favorite of the ancient pharaohs, this dog breed is one of the most primitive breeds to be discovered in Africa. They served as game dogs then and, after surviving periodic distemper epidemics from the late 19th to the early 20th century, became novel show dogs in England. America fell in love with the breed, too. Also known as the congo dog, this breed became the main subject of some 1950s books and film. A huge number were imported from Africa later to correct some genetic health problem. Although it may seem to you that this dog breed doesn’t look the part, the breed is a recognized sight hound that can compete fiercely in trials. The Basenji has more of a terrier’s feisty temperament than that of a hound. It is hyperactive and inquisitive. The dogs require early socialization in order to curb aggressive dog behavior against other canines. In contrast, the breed is so attached to humans that it’s not safe to leave the pooch alone for so long. They are prone to separation anxiety and can even trash your home at the extreme. They fare better in the company of experienced dog owners. Living Environment – A warm environment is the only suitable living condition for the Basenji. The pooch is extremely sensitive to cold temperatures and must therefore be treated as an indoor pet who likes some outdoor fun. Access to a yard is optimal for this energetic breed. Caveat: These dogs are known to take off without a leash, so make sure your fence is as escape-proof as possible. Grooming – The pooches can give you a breather in the grooming department. Their short and sleek coat is easy to care for. The best part is that they’re non-shedders, or if they do shed a bit, you won’t even notice it! There are 2 ways you can get rid of your pet’s dead hair: combing or wiping with a damp cloth. Diet & Exercise – A fare of green vegetables, brown rice and meat is the norm. Poultry, beef and horse meat come along as top protein choices. You may also add in some wheat to the meal but must be careful not to omit greens from the diet. Serving size usually ranges from 1.5 to 3 cups. This dog breed’s moderate exercise needs must be met on a 24-hour basis. They are “moderate” in a sense that strenuous physical exertion is not mandatory. However, your pet will be calmer indoors if you are able to satiate its desire for long walks or some hours of off-leash play in a yard. They particularly relish hunting trips. Health – Kidney and eye diseases are linked to the breed. In particular, the Fanconi syndrome is a genetic condition for a number of these dogs. The syndrome lies in the inability of the renal tubes to retain nutrients. Eventually, the condition causes other organs to break down. Careful dietary planning and supplementation will help your dog manage the condition. The Basenji is not a dog breed for the novice handler. They have a very short attention span and a tendency to be manipulative. For successful dog training, you must be firm and innovative, while your pet must be adequately socialized and kept interested enough to learn. The pooches excel in agility tracks and course trailing. Although challenging to coach, this intelligent dog breed offers you one welcome consolation: they are easy to housebreak. I got him without researching first. He was 6 months at the time (4 now). I got him from craigslist.